The Moon and stars over Grand Canyon-Parashant National Monument, Arizona. Photo by Nicholas Glover. TUCSON, AZ AND GRAND CANYON-PARASHANT NATIONAL MONUMENT, AZ, 21 March 2014 – The remote, wild character of rural northwest Arizona has long drawn dedicated adventurers who value protection of the area’s abundant natural resources. Lately, dark night skies have earned a place among these precious assets worthy of preservation. In recognition of exceptional efforts to this end, the International Dark Sky Association announced today that it has designated Grand Canyon-Parashant National Monument as part of its International Dark Sky Places Program. 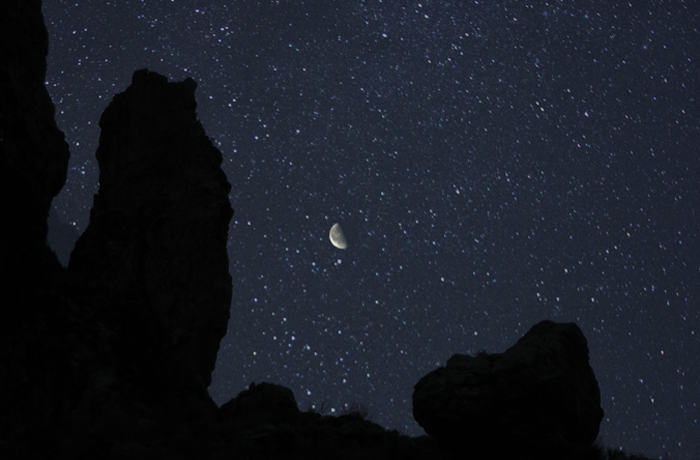 The new International Dark Sky Place is also known as “Parashant International Night Sky Province.” A public event to celebrate the designation will be held April 26 at Dixie State University in St. George, Utah. “Parashant has outstanding Gold-tier night skies—some of the best in the southwest. Their new designation marks them as an environmental leader in moving to preserve the Monument’s starry skies for generations to come,” said IDA Executive Director Bob Parks. Grand Canyon-Parashant National Monument, established in 2000, consists of 1.05 million acres (42,000 ha) of land on the “Arizona Strip,” the portion of Arizona lying north of the Colorado River. The Monument is bounded to the south by the Grand Canyon and on the west by the Arizona-Nevada border. At the junction of the Colorado Plateau, Mojave Desert and Great Basin, it is among the most isolated of the federally managed land units in the contiguous 48 states. The National Park Service and the U.S. Bureau of Land Management manage the administration of Grand Canyon-Parashant National Monument jointly. While the NPS counts four other of its properties among IDA International Dark Sky Parks, the IDA recognition of Parashant is a first for lands within the BLM portfolio. NPS Director Jonathan Jarvis characterized today’s award as the result of a “beautiful partnership” with BLM. He hopes that IDA’s recognition of Parashant will attract other BLM sites on the Colorado Plateau to join in educating communities and protecting night skies. “The night sky is something you can restore. It’s not gone, it’s still there and all we have to do is pay attention to our lighting,” Jarvis said. The human presence in Parashant extends back as far as the Paleoindians who arrived in the Arizona Strip near the end of the last Ice Age nearly 13,000 years ago. Remnants of formerly extensive Puebloan (Anasazi) and Southern Paiute cultures are found on the Monument. Mining activities, timber cutting, and settlement by farmers and ranchers began by the 1870s and continued into the early twentieth century. Parashant’s extreme remoteness discouraged all but the hardiest of settlers, which helped protect its skies from brightening after the advent of electric lighting. Dark skies advocates hope to capitalize on today’s announcement and carry the momentum forward toward the protection of additional lands in the region. Interagency cooperation is seen as key to the success of this effort. “Parashant International Night Sky Province embodies the collaboration between multiple agencies and landowners that will lead to the continued success of the Colorado Plateau Dark Sky Cooperative,” said Nathan Ament, Coordinator of the Colorado Plateau Dark Sky Cooperative, an NPS-sponsored collaboration dedicated to the preservation of dark night skies on federal lands in the Four Corners area. “It represents NPS and BLM’s dedication to leading the way in protecting natural darkness as a precious resource on the Colorado Plateau,” Ament explained. Parashant joins other IDA Dark Sky Places already designated on the Colorado Plateau, including Flagstaff, AZ; Natural Bridges National Monument, UT; and Chaco Canyon National Historical Park, NM. Efforts are now underway at nearby Grand Canyon National Park to seek a similar IDA designation. Officials at Parashant and the Grand Canyon envision a future in which community partnerships, public education, and voluntary efforts to place sensible controls on outdoor lighting lead to more dark skies conservation along the nearly 300-mile-long Colorado River corridor in northern Arizona. IDA established the International Dark Sky Places conservation program in 2001 to recognize excellent stewardship of the night sky. Designations are based on stringent outdoor lighting standards and innovative community outreach. Since the program began, six communities, 16 parks and eight reserves have received International Dark Sky Place designations.